← November 2015 Global Surface (Land+Ocean) and Lower Troposphere Temperature Anomaly & Model-Data Difference Update. This article is also cross posted at Judith Curry’s ClimateEtc. But those posts related primarily to the last few decades. In this post, we’re going to briefly examine the long-term data and then focus on the post-World-War 2 period—a period when there are major differences between the two sea surface temperature datasets that are used in the combined land+ocean surface temperature products from GISS and NOAA (both of which use NOAA’s ERSST.v4) and UKMO (which uses HADSST3). The differences in the two datasets are related to the Thompson et al. 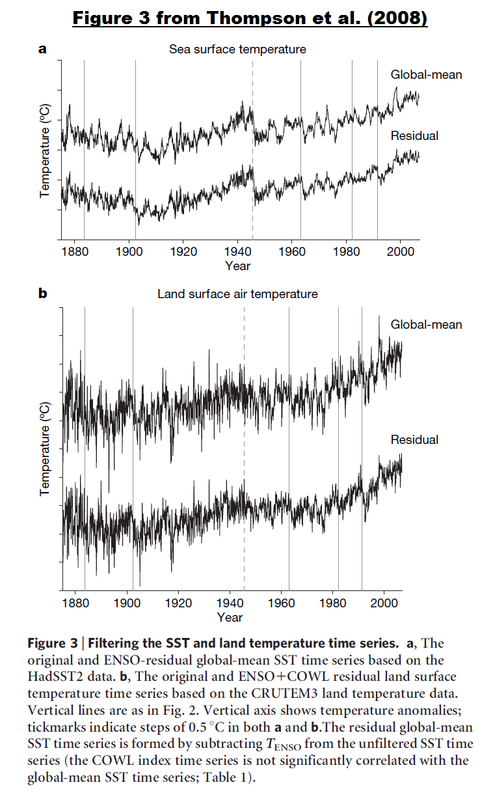 (2008) letter A large discontinuity in the mid-twentieth century in observed global-mean surface temperature. (Paywalled. Used to be available at the Colorado State University website.) The UKMO adjusted their sea surface temperature data to correct the discontinuity, while NOAA didn’t. It appears that NOAA is attempting to bust the mid-20th Century pause as well as increase the warming rate from the mid-20th Century to present. But first, some background information about long-term ocean surface temperature reconstructions. Karl et al. (2015) Possible artifacts of data biases in the recent global surface warming hiatus. The top graph in Figure 1 compares the four datasets globally (60S-60N), excluding the polar oceans. 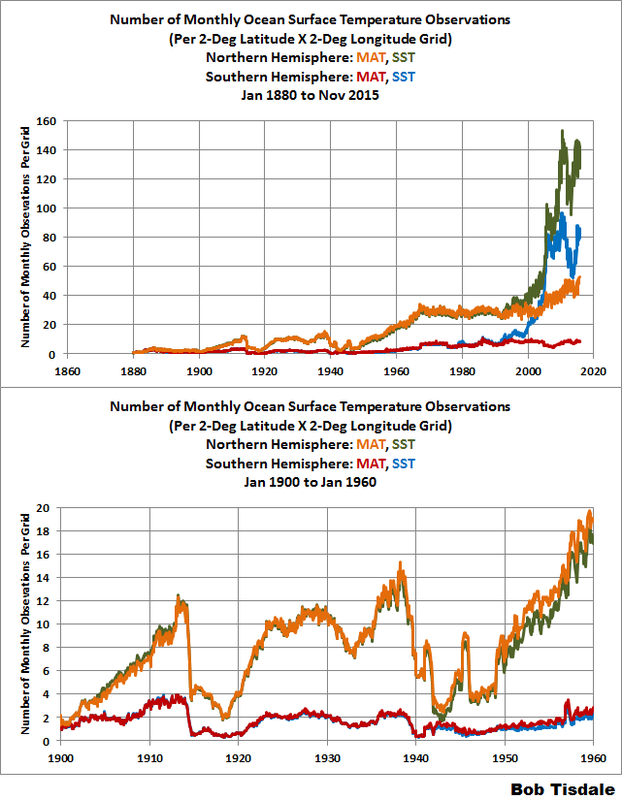 The middle and bottom graphs include the comparisons for the Northern (0-60N) and Southern (60S-0) Hemispheres, again excluding the polar oceans. The polar oceans are normally excluded in comparisons such as these because the data suppliers account for sea ice differently. The source of the data in this post is the KNMI Climate Explorer. The marine air temperature data come in two flavors. The source data include day and night measurements, while the end product includes mostly nighttime observations. The UKMO deletes most of the daytime marine air temperature observations because of the heating of ship surfaces by sunlight. Let me explain the “mostly” and “most of”. The spike in the marine air temperature (day and night) data from the early- to mid-1940s stands out in Figure 1. But the spike is more prevalent in the nighttime samples than daytime. See Figure 2, which is Figure 9 from Kent et al. (2013). So to minimize the spike, the HadNMAT2 data use daytime marine air temperature data from 1942 to February 1946. Data from ICOADS Release 2.5 still show additional warmth in their nighttime air temperature anomalies during WW2, from 1942, and the latter part of the adjustment applied by Rayner et al. is therefore still required and appropriate. Here, we amend it slightly and replace NMAT anomalies between 1942 and February 1946 with DMAT anomalies, adjusted according to the difference between DMAT and NMAT anomalies over the period 1947–1956. Additionally, daytime air temperature anomalies for Deck 195 (U.S. Navy Ships Logs) were anomalously warm compared with data from other Decks and are excluded. An adjustment prior to 1942 appears not to be required due to the addition of many recently digitized measurements for this period. 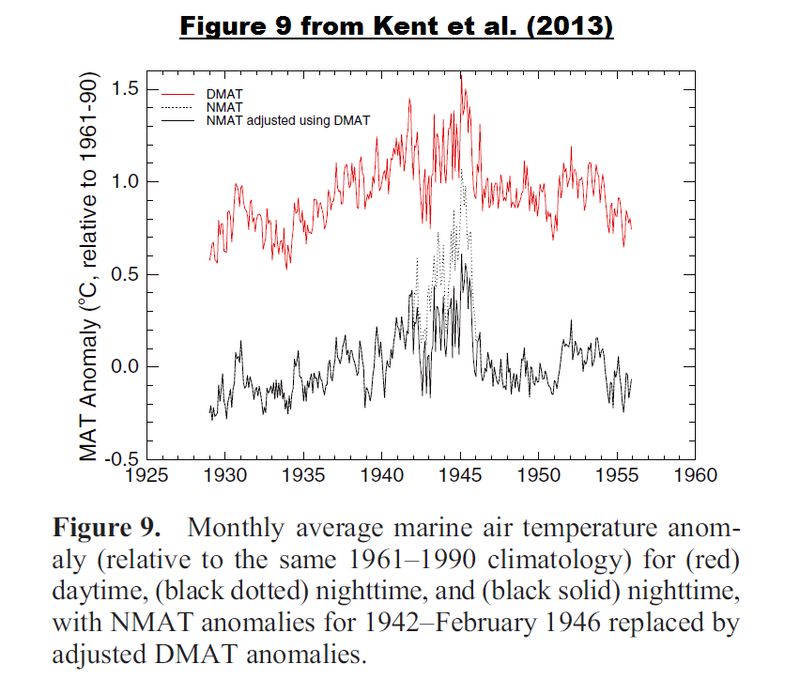 Figure 9 shows time series of monthly unadjusted and adjusted NMAT anomalies for the period 1929–1955, along with the daytime air temperature data used in the adjustment process. Over the term of the dataset, HadNMAT2 are also adjusted for other factors such as observation (ship deck) height and wind speed. The other major difference that stands out in Figure 1 relates to the source ICOADS sea surface temperature data before the 1940s. The source sea surface temperature data run “cooler” than the others. That divergence is attributed to the transitions from different sampling methods: buckets of different types to ship inlets. For their ERSST.v4 data, NOAA assumed the HadNMAT2 data are correct and used the HadNMAT2 night marine air temperature data for bias corrections (full term) of ship-based observations. NOAA’s reference for the using night marine air temperature to adjust sea surface temperature data was Smith and Reynolds (2002) Bias Corrections for Historical Sea Surface Temperatures Based on Marine Air Temperatures. Thus the ERSST.v4 data mimic the HadNMAT data. See Figure 3. In 2008, Thompson et al. A large discontinuity in the mid-twentieth century in observed global-mean surface temperature (paywalled) brought attention to the sharp drop in sea surface temperatures in 1945, which is the last year of World War 2. They used a number of metrics, including an ENSO index and stratospheric aerosols, to show that the sharp drop-off in sea surface temperatures in 1945 was not caused by volcanos or by the transition from an El Niño to a La Niña. See Figure 4, which uses the same source data and end products as Figure 1, but runs from 1940 to 1975. In other words, the discontinuity in the night marine air temperature may also result from observation biases, which then get passed on to the NOAA ERSST.v4 data. Regardless, Thompson et al. (2008) found there was no basis for the 1945 discontinuity, yet NOAA did not correct for it in their ERSST.v4 “pause(s)-buster” data. In addition to changes in temperature-sampling practices, there are a couple of other things to consider when looking at sea surface and marine air temperature data during the 1940s and 50s. First, the number of source (ICOADS) sea surface temperature observations drops off drastically in some ocean basins during the early 1940s, while in others the sampling was so poor to begin with that the wartime decreases in ship traffic appear to have had little impact on the number of observations there. See Figure 5, which includes the number of observations per 2-deg latitude by 2-deg longitude grid, for the North Atlantic (0-60N, 80W-0), South Atlantic (60S-0, 70W-20E), Indian (60S-30N, 20E-120E), North Pacific (0-60N, 100E-90W) and South Pacific (60S-0, 120E-70W) basins. (The number of observations for the ICOADS v2.5 sea surface and marine air temperature data are available from the KNMI Climate Explorer.) The top graph runs from January 1880 to November 2015, and, in the bottom graph, I’ve shortened the time to January 1900 to January 1960 so that the world war periods are easier to see. The same holds true for the ICOADS source marine air temperature (day and night) data. The number of source (ICOADS) marine air temperature observations drops off drastically in some ocean basins during the early 1940s, while in others the sampling was very poor before, during and after World War 2. See Figure 6. Now consider, for the HadNMAT2 data, the number of observations is roughly half of what’s shown because they use only nighttime observations (except during World War 2, as discussed above, when they use only daytime observations). Figure 7 includes the number of marine air temperature (MAT) and sea surface temperature (SST) observations for the Northern (0-60N) and Southern (60S-0) Hemispheres per 2×2 deg grid. I’ve provided it to better show the disparity between the hemispheres in the number of observations. 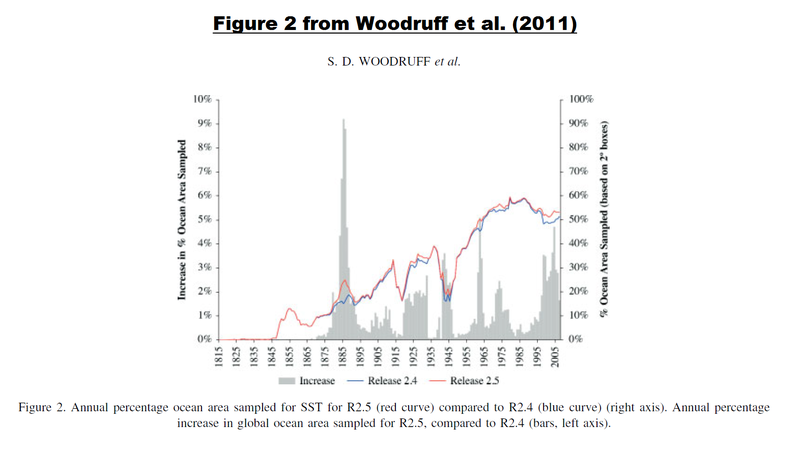 It indicates the number of sea surface and marine air temperature observations are similar until the 1990s, when, assumedly, the deployment of moored and drifting buoys provided a marked increase in the number of sea surface temperature observations…which then skyrocketed in 2005. But the number of observations per grid doesn’t tell the entire story. The spatial coverage of the global oceans also declined drastically during World War 2. My Figure 8 is Figure 2 from Woodruff et al. (2011), which was the support paper for the current version of the ICOADS source data. We’re interested in the red curve (Release 2.5) which relates to the right-hand scale. It shows that during the Second World War the 2×2-deg latitude-longitude grids with sea surface temperature observations covered only roughly 20% of the surface of the global oceans. Something else to consider: the grids with data do not remain constant. They obviously depend on where ships traveled, which changed from month to month. To help you visualize this, the maps in Animation 1 show the grids with data, running from January 1935 to December 1950. I’ve also included notes on some months (and paused the animation) to indicate when World War 2 started and ended and to highlight the month with what appears to be the poorest spatial coverage (December 1941, associated with Pearl Harbor). As discussed and illustrated above, many of the ocean grids do not contain data. For datasets that did not incorporate satellite-based data starting in the early 1980s, this problem of poor spatial coverage remained until recent decades when drifting buoys (not ARGO floats) were deployed. That is, coverage improved since the 1950s, but there were still many portions of the Southern Hemisphere (south of 30S) with little source data until the drifters. There are a number of different statistical methods that suppliers use to fill in the blank grids…if they elect to infill them. Figure 9 includes maps of ocean surface temperature-related data for the month of December 1941…a worst-case example during World War 2, but could be considered a best-case example before 1900. (See my Figure 8 again.) Now consider that ICOADS showed that grids with source data covered roughly only 20% of the surface area of the global oceans. 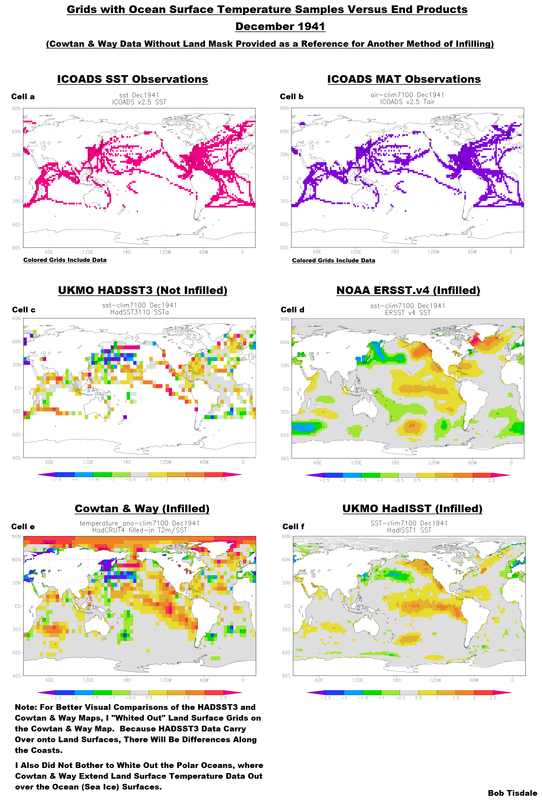 That means, in these examples, roughly 80% of sea surface temperature data in the infilled datasets (Cowtan and Way, ERSST.v4 and HadISST) are make-believe…created using statistical methods that provide strikingly different results in the patterns of sea surface temperature anomalies. See Animation 2. The top two graphs show the grids with source data for the ICOADS source sea surface temperature (Cell a) and marine air temperature (Cell b) datasets. Directly below them are maps of the sea surface temperature anomalies for the not-infilled UKMO HADSST3 sea surface temperature (Cell c) and the infilled NOAA ERSST (Cell d) products. On the left of the third tier is the December 1941 temperature anomalies of the Cowtan and Way product (Cell e), which infills UKMO HADSST3 data, and to the right (Cell f) is HadISST data (not the same as HADSST3), which are infilled using yet another method. The UKMO elects not to fill in grids without source data for their HADSST3 data (used in their HadCRUT4 global surface temperature product) or its HadNMAT2 data (used by NOAA for ship-bias corrections). But referring to the maps in Figure 9, we can see that more of the oceans are covered with the HADSST3 (Cell c) than its sea surface temperature (Cell a) source data. (The same would hold true for the HadNMAT2 data, but, unfortunately, the map-plotting feature for the HadNMAT2 data were not available at the KNMI Climate Explorer when I prepared this post.) The UKMO accomplishes this limited infilling in a very simple way. The source data are furnished in 2-deg latitude by 2-deg longitude grids, where the two not-infilled UKMO products are presented in 5-deg latitude by 5-deg longitude grids. A 2×2-deg grid with data has been expanded to a 5×5-deg grid. (See the animation here for the comparisons of the coverage of the ICOADS source and UKMO end products for sea surface temperatures.) Also, the UKMO indirectly fills in their products (by hemisphere) in their monthly and annual time series values. They do this per hemisphere by determining the average value of the grids with data, which then get assigned by default to the grids without data. The bottom right-hand map includes the sea surface temperature anomalies based on the UKMO’s infilled sea surface temperature dataset called HadISST (Hadley Centre Sea Ice and Sea Surface Temperature data set). HadISST is NOT the same as HadSST3. HadISST is supported by the 2003 Rayner et al. 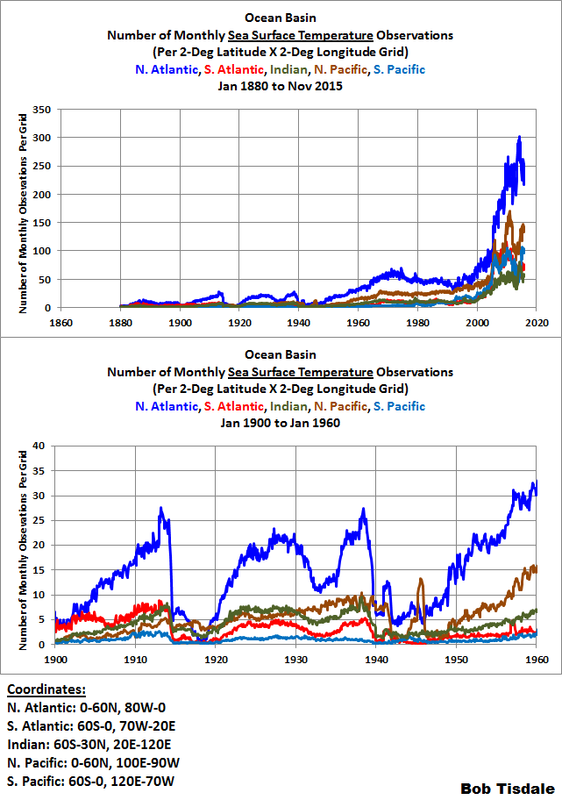 paper Global analyses of sea surface temperature, sea ice, and night marine air temperature since the late nineteenth century. HadISST uses satellite-enhanced sea surface temperature data starting in the early 1980s, and it also uses a statistical tool called Empirical Orthogonal Function (EOF) analysis to infill missing data. Like NOAA and their EOT analysis, the UKMO uses the EOF-found spatial patterns during the satellite era to infill missing data before the satellite era. I believe the UKMO includes another step for the HadISST data that is not employed by NOAA, whereby the UKMO reinsert in-situ data when there is insufficient source data for the EOF analysis. Bottom line: There are few similarities between the sea surface temperature anomaly patterns in the maps of the three infilled sea surface temperature datasets (HadISST, ERSST.v4, and Cowtan and Way) in this worst-case month. In more recent times, before the drifters were deployed heavily in the 2000s, you’d still find major differences in those spatial patterns, primarily where in situ-sampling was poor, like south of 30S. NOTE: Notice the odd-looking “El Niño” in the Cowtan and Way data, Figure 9, Cell e.
Kriging offers several benefits. The reconstructed values vary smoothly and match the observed values at the coordinates of the observations. The reconstructed values approach the global mean as the distance from the nearest observation increases, i.e. the method is conservative with respect to poor coverage. Clustered observations are downweighted in accordance with the amount of independent information they contribute to the reconstructed value; thus area weighting is an emergent property of the method, with observations being weighted by density in densely sampled regions and by the region over which the observation is informative in sparse regions. Kriging the gridded data also has some significant disadvantages: information about station position within a cell is lost, cells with a single station receive the same weight as cells with many and (equivalently) no account is taken of the uncertainty in a cell value. The acceptability of these compromises will become apparent in the validation step. But Cowtan and Way (2014) forgot to discuss a blatantly obvious disadvantage of Kriging: As shown in Figure 9, Cell e, Kriging can also create a spatial pattern that bears no resemblance to known phenomena, like their El Niño that runs diagonally, from the northwest to the southeast across the eastern tropical Pacific. Although some gridded SST data sets contain many grid boxes which are not assigned an SST value because they contain no measurements, other SST data sets – oftentimes referred to as SST analyses – use a variety of techniques to fill the gaps. They use information gleaned from data-rich periods to estimate the parameters of statistical models that are then used to estimate SSTs in the data voids, often by interpolation or pattern fitting. There are many ways to tackle this problem and all are necessarily approximations to the truth. The correctness of the analysis uncertainty estimates derived from these statistical methods are conditional upon the correctness of the methods, inputs and assumptions used to derive them. No method is correct therefore analytic uncertainties based on a particular method will not give a definitive estimate of the true uncertainty. Please read the remainder of that section of Kennedy (2014). In fact, the entire paper provides an excellent detailed discussion of the uncertainties associated with sea surface temperature data. The global and hemispheric time series graphs in Figure 10 compare the HADSST3 and NOAA ERSST.v4 sea surface temperature products from 1880 to 2014. Notice the differences between the NOAA ERSST.v4 and UKMO anomalies from the mid-1940s to the mid-1970s. The ERSST.v4 data run noticeably “cooler” than the HADSST3 data. I’ve highlighted the post-World War 2 (post-discontinuity) differences in Figure 11, which includes the UKMO HADSST3 and NOAA ERSST.v4 data for the period of 1940 to 1975. UKMO have corrected the HADSST3 data to account for the 1945 discontinuity and trailing irregularities. NOAA has not made those corrections with their ERSST.v4 data. NOAA elected to use the HadNMAT2 data for bias corrections of ship-based data during this time…even though, as quoted earlier, Kent et al. 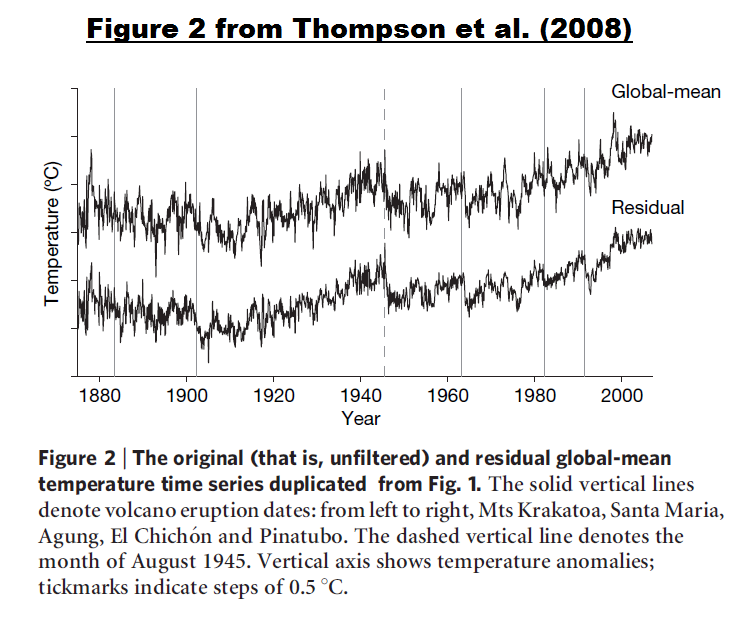 (2013) expressed concerns about the HadNMAT2 data during the period, and even though Thompson et al. (2008) concluded there was no reason for the discontinuity. WHY DO YOU SUPPOSE NOAA FAILED TO CORRECT FOR THE 1945 DISCONTINUITY AND SUBSEQUENT BIASES? Contrary to much recent discussion, the latest corrected analysis shows that the rate of global warming has continued, and there has been no slowdown. Note that the trend line starts in 1951. That suggests the recent warming period started in 1951, not the mid-1970s (1975) as has typically been used. In other words, not only has NOAA endeavored to eliminate the slowdown in global warming in recent years, NOAA also appears to be attempting to eliminate the slowdown (or cooling) of global surface temperatures from the mid-20th Century to the mid-1970s. Let’s return to the global sea surface temperature anomaly data. The top graph in Figure 13 compares the linear trends of the global (60S-60N) NOAA ERSST.v4 and UKMO HADSST3 data for the period of 1951 (NOAA’s start year for their trend line in Figure 12) to 1975 (1975 is often used as the breakpoint between the mid-20th Century pause in global warming and the latest warming period). Globally, the NOAA ERSST.v4 data show warming from 1951 to 1975, while the UKMO HADSST3 data show cooling. Because the NOAA ERSST.v4 data run “cooler” than the UKMO HADSST3 data during the 1950s and 60s, the warming rate of the NOAA ERSST.v4 data from 1951 to 2014 is noticeably higher than the UKMO HADSST3, globally and in both hemispheres. See the bottom graph in Figure 13. Since we’ve been discussing the discontinuity starting in 1945, let’s start the comparisons in that year and we’ll end again in 1975, for the top graph in Figure 14. That also provides us with 31 years for the mid-20th Century slowdown (cooling) period. Once again, globally, the UKMO HADSST3 data show cooling from 1945 to 1975, while the NOAA ERSST.v4 data show warming. And it should go without saying that the global sea surface temperature warming rate of the NOAA ERSST.v4 data from 1945 to 2014 is noticeably higher than the UKMO HADSST3, because the NOAA ERSST.v4 data run “cooler” than the UKMO HADSST3 data during the late-1940s, 50s and 60s. Refer to the bottom graph in Figure 14. It appears that NOAA is attempting to eliminate another pause in the warming of global surfaces, this time the mid-20th Century slowdown/cooling period. NOAA overlooked the concerns expressed by the supplier of their reference night marine air temperature data during the post-World War 2 period. most importantly, for the “underlying science”, how NOAA appears to have adjusted out a difference between ship temperature measurements and night marine air temperature that should exist according to the consensus of the newer climate models—once again assuming that NOAA’s other grand assumption…“The model SAT is used since the model bias is assumed to be the same during daytime and nighttime”…is correct. NOAA failed to make the necessary mid-20th Century adjustments to their ERSST.v4 sea surface temperature datasets—corrections that would have been supported by Thompson et al. (2008). Likely reasons: (1) NOAA did not want to decrease the warming rate starting in 1950 that would have resulted if they had made those corrections and (2) NOAA wanted to show a more continuous warming since 1950, which would not have existed if they had made those corrections. Once again, maybe, in time, Dr. Sullivan of NOAA will produce the emails requested by Representative Smith so that we can confirm my suspicions and the suspicions of many others. Last, I suspect some persons will argue that there is too much uncertainty during this period for the results shown in this post to have any merit. I will counter with the argument that, as a whole, climate science as practiced by NOAA is not focused on uncertainties in their presentations to the public. Do we see any uncertainties expressed in any way in NOAA’s press release for Karl et al. 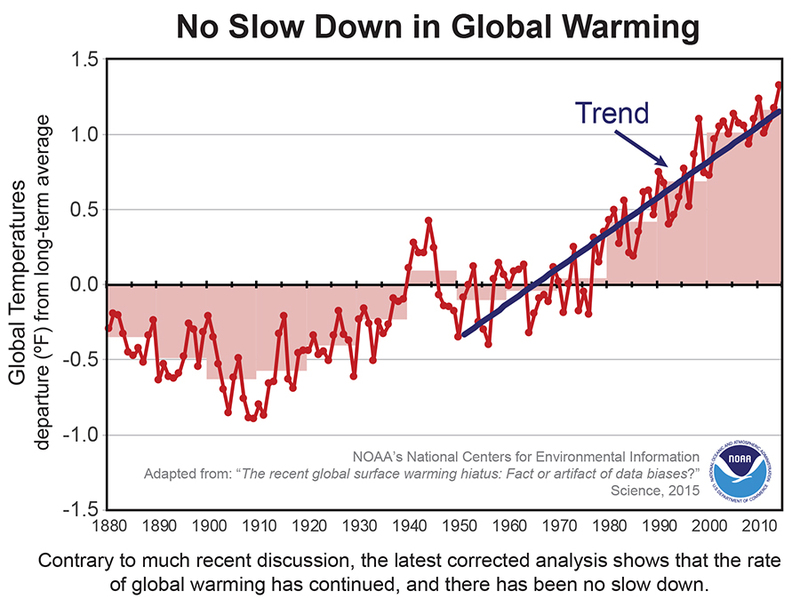 (2015) Science publishes new NOAA analysis: Data show no recent slowdown in global warming? A new paper by Huang et al (2015) Further Exploring and Quantifying Uncertainties for Extended Reconstructed Sea Surface Temperature (ERSST) Version 4 (v4) is in press (preliminary accepted version is paywalled). Will NOAA demonstrate a commitment to honestly communicating with the public by producing an easy-to-understand press release for it…showing the wide ranges of uncertainties in the warming rates? This entry was posted in NOAA ERSST.v4. Bookmark the permalink. Thanks, Bob. I’m still reading your very interesting post, but I found your link to the Kennedy (2014) submitted copy of the paper points to the submitted copy of his 2013 paper (http://www.metoffice.gov.uk/hadobs/hadsst3/Kennedy_2013_submitted.pdf). During the posts by Tony Heller pointing out the infilling that NOAA was using to put data where there was none and having the effect of raising the global temperature, I had the opportunity to write Howard Diamond, Director of World Meteorological Data, to get his comments. My original contact with him was the result of a pointed criticism I posted on a NOAA site for which I got a very detailed response. From this inquiry I received what was probably a 3 page response quite specific to my questions. He most emphatically stated that NOAA does not do ANY INFILLING. He also included the paper describing their process by Cowtan and Way where they defined the process as Kriging. A rose by any other name…. Anyway they officially denied any wrongdoing. Can’t say as I was surprised. Great article, full of really good info. All of your posts serve as reference documents, as needed for the future. And a very Merry Christmas to you. globalcooler, your contact at World Meteorological Data should attempt to understand the subject matter he’s discussing before he claims that global sea surface (and land air) temperature datasets are not infilled. He is in charge of the management of the data for the whole world for NOAA. “Director, World Data Center for Meteorology at NOAA’s National Climatic Data Center” was his complete title. I am sure he knows what he is doing and what infilling means. They just have a different name for it. It may seem logical to assume that NOAA, IPCC, NASA etc. have incompetent people but I don’t believe that. The complaint I made was detailed and backed by references to reputable sites, some NOAA and NASA. I am sure that the Director of World Met Data doesn’t respond with long detailed letters to every complaint. They pulled out the big gun. I considered it a compliment. I pointed out the fallacies in his response and he allowed I might have a different opinion. He was not about to admit anything. 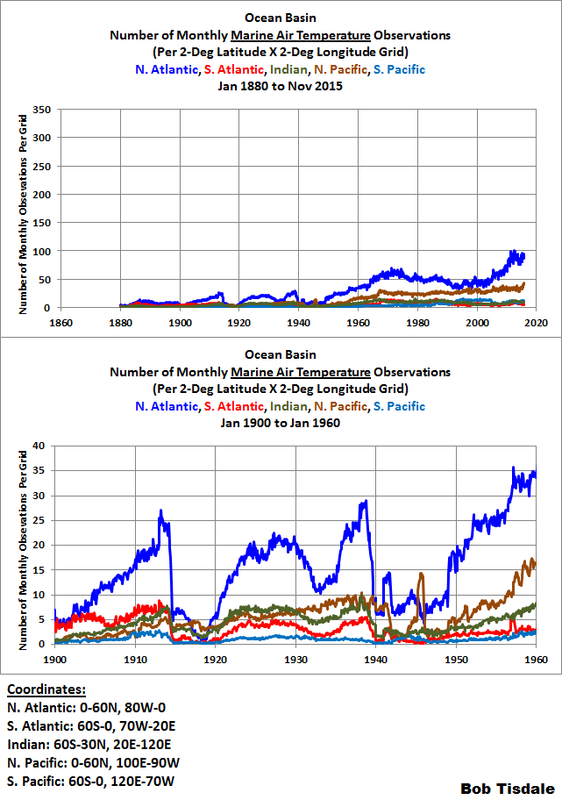 Pingback: NOAA’s New “Pauses-Buster” Sea Surface Temperature Data – The Curiosities Extend into the 1st Half of the 20th Century… | Watts Up With That? Pingback: The Oddities in NOAA’s New “Pause-Buster” Sea Surface Temperature Product – An Overview of Past Posts | Watts Up With That? Pingback: On the Monumental Differences in Warming Rates between Global Sea Surface Temperature Datasets during the NOAA-Picked Global-Warming Hiatus Period of 2000 to 2014 | Watts Up With That? 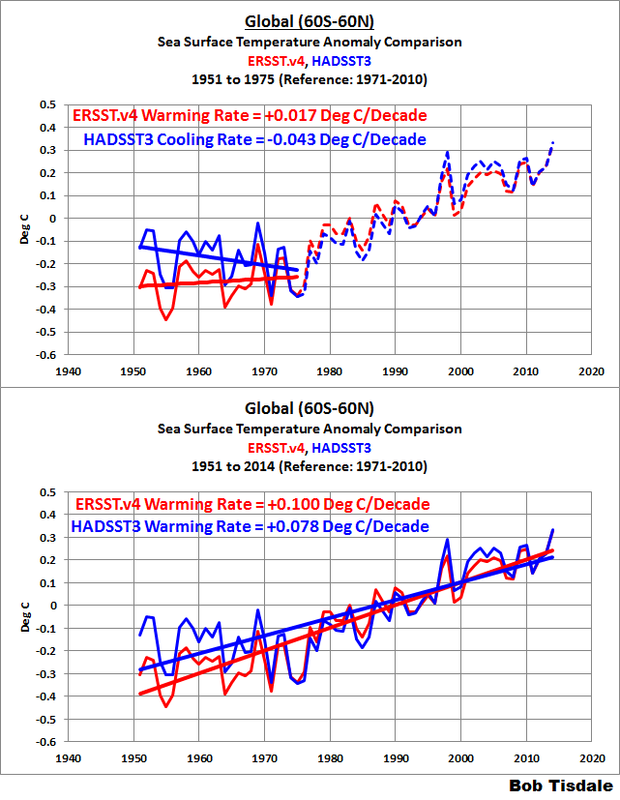 Pingback: Do the Adjustments to Sea Surface Temperature Data Lower the Global Warming Rate? | Watts Up With That? Pingback: Do the Adjustments to Land Surface Air Temperature Data Increase the Global Warming Rate? | Watts Up With That? Pingback: UPDATED: Do the Adjustments to Land Surface Temperature Data Increase the Reported Global Warming Rate? | Watts Up With That? Pingback: Do the Adjustments to the Global Land+Ocean Surface Temperature Data Always Decrease the Reported Global Warming Rate? | Watts Up With That?